World Wide Waftage - Wafting Through Our World Wide Travels with Ease, Joy and Simplicity: Exciting new vacation home location...Photos and more.. 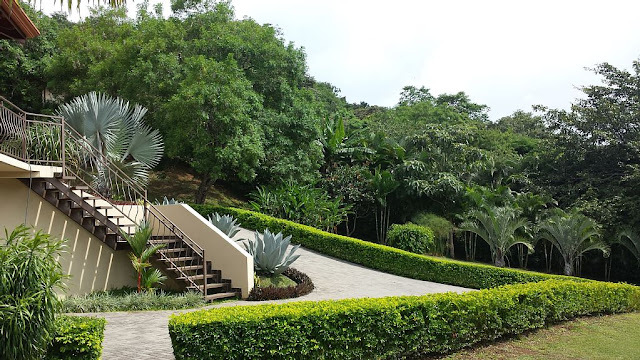 Exciting new vacation home location...Photos and more..
Its easy for us to imagine how much we'll enjoy time outdoors at our new three month booking in Costa Rica while on our way to South America after visiting family and friends in the US. Twenty one months from now may seem like an eternity to some. For us, its a hop, skip and jump along the way in our world travels. Otherwise, we may not have booked this new vacation property as quickly as we did, shortly after it hit the vacation home market. Based on its beauty and fair pricing, we figured it would be snapped up quickly when at times we've noticed especially lovely vacation listings booked as far out as two years in advance in popular locations. Another view of the pool and veranda. In late May, 2017 we'll arrive in the US (18 months from now), arriving by cruise ship to Seattle, Washington where we'll rent a car to make our way across the northern part of the US, across Yellowstone National Park, which Tom has yet so see.. (I can't wait to see his face when we drive through this amazing area, my personal favorite US location). We'll continue on making our way to Minnesota where three of our adult children, their spouses and our six grandchildren reside along with most of Tom's siblings, other family members and many of our friends. It will be a busy period and we're considering accommodations for the weeks we'll spend in Minnesota. We'll certainly enjoy the hot tub on a moonlit night! After leaving Minnesota, we'll fly to Nevada, to visit eldest son Richard in Henderson and eldest sister Susan in Las Vegas, where we'll stay for another week. As Nevada residents, we'll renew our driver's licenses and take care of any "business" matters best handled in person. Then, we're off again. We'd hoped for an Alaskan cruise at this juncture but listings haven't been posted this far in advance. We'll see if its a possibility in the near future. The spacious, comfortable living room overlooking the pool. Hovering in our minds, knowing the above trip to the US is definitely on the itinerary, we've been considering possible plans when we'll leave the US, no later than August 1, 2017. Serendipity. Safari luck. It all comes into play during our world journey. Whether its good luck or fortuitous, we always grateful for the opportunities as they enter our lives. In part, we always feel we play a role in "safari luck" in that our assertiveness and determination play a role in "being in the right place at the right time." Most likely, we won't use this formal dining room, instead dining outdoors or at the granite kitchen counter as shown in this photo. The property also includes an outdoor kitchen. Thus is the case of our newly booked vacation home with a deposit paid this morning for August 1, 2017 though October 31, 2017 (the day of our five year travel anniversary). 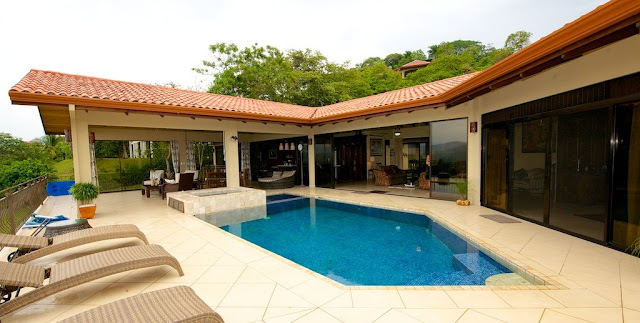 We're renting an exquisite house in Costa Rica, on our way to South America from the US. How this property materialized is the magical part. While living in Kauai for four months, each month we attended friend Richard's Full Moon Parties. At the second such delightful party, we met lovely couple Bev and Sam with whom we had an instant connection. 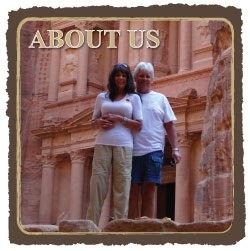 They've traveled the world extensively with many exciting stories to share. One of two master bedrooms in the three bedroom house. Later, they invited us to their breathtaking home, located in a former botanical garden, for "movie night" in their outdoor "screening room" in a separate building on their grounds established as a technologically advanced movie theatre. On another occasion, they invited us to dinner at their home when sister Julie was visiting and we had another enjoyable evening with Bev and Sam. After we left Kauai, we've stayed in touch by email occasionally sharing tidbits about our lives and travels. Click here for the link one and link two to Bev and Sam's gorgeous home in Kauai for which we included two day's posts. 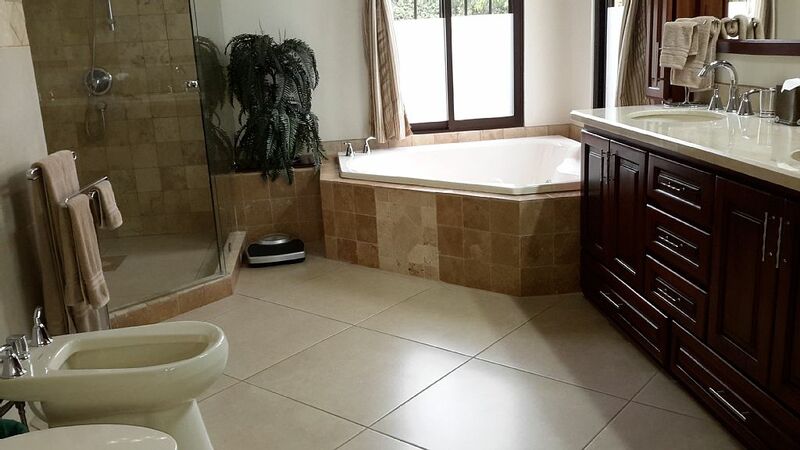 The huge en suite master bath with large shower, soaking tub, double sinks and bidet. From these several interactions with Bev and Sam, a friendship was born that we'll always treasure, along with many others with whom we'd become close during that special, highly social four month period in Kauai. Before we left Kauai, Bev and Sam, had mentioned their recent purchase of another home in Costa Rica. We were happy for them in their obvious enthusiasm and asked they send us photos when they could, allowing us to revel along with them in their excitement. Never did we think, for a moment, that their new home in Costa Rica would impact our lives of travel. A few weeks ago, I sent Bev an email to say hello. While chatting back and forth, she explained they'd recently listed their new home in Costa Rica on vacation rental site VRBO, (owned by Homeaway, the company we most often use for booking vacation rentals). View from the veranda to the valley below. We don't mind not having an ocean view on this occasion. As we opened the link to their new home in Costa Rica, we did so as friends sharing in their joy in reviewing the listing, never thinking it would apply to us. Knowing their fine taste and the magnificence of their home in Kauai, it wasn't even on our radar as remotely within our budgeted price range. Once we saw the photos, we fell in love with the property; the location, the house and the grounds, each possessing unique qualities seldom found in vacation homes within a manageable price range. Click here for the pricing and detailed listing for the home in Costa Rica on VRBO. Expressing our interest in the property to Bev and Sam while curious if somehow it could work for us, they kindly proposed a three month price for us that fits exactly into our range of affordability. As of early this morning, we paid the deposit and signed the agreement online for our negotiated price and entered the deposit with the management company they've employed to handle such matters. Its a "done deal." We couldn't be more thrilled to have this over-the-top property as our home for a full three months after leaving the US while as we begin our segue to South America. The gorgeous grounds are professionally maintained. Its a reasonable flight from Las Vegas which after checking online shouldn't be too difficult. Although the rental period is for 92 days, the visa stamp provided US citizens at the airport is 90 days. We'll ask for the extra two days at the immigration counter at the airport and if unable to receive it, we'll depart two days earlier. 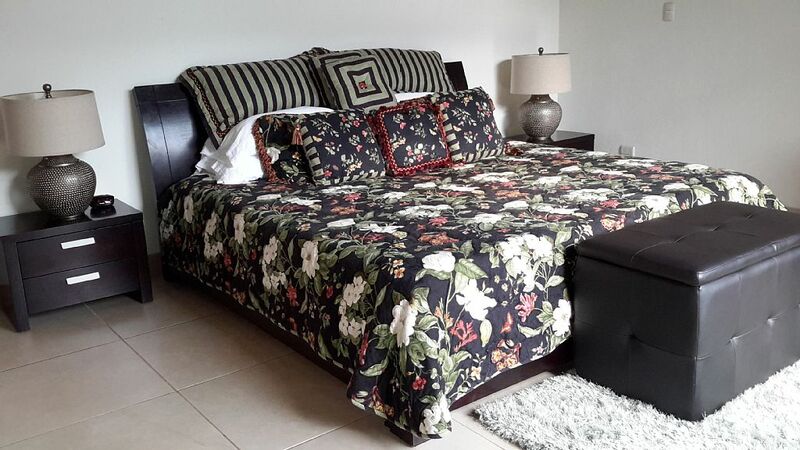 Our rental agreement is based on the month, not a daily rate. We're grateful to Bev and Sam for making this work for us, as well as excited to be able to spend three months in this special property, treating their home with the same care as we always do for any vacation rental we've rented throughout the world. Costa Rica, known for its abundant wildlife and vegetation particularly appeals to our senses. Able to speak a little Spanish and definitely able to read the written word, it will be relatively easy communicating while there and later in South America. 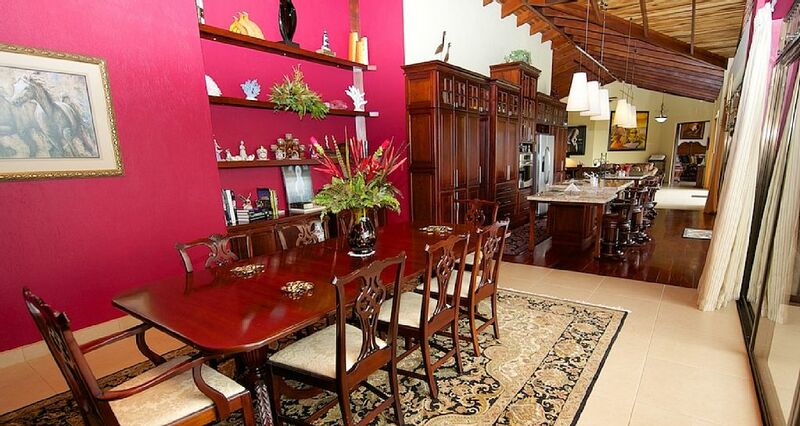 Today, we share a few of the photos of this fabulous home and will include many more once we arrive in Costa Rica. Also, today we're updating our itinerary and budget to include this fine property. With several gaps to fill in our upcoming schedule, our work is cut out for us as always, a aspect of our travels we both find interesting and fun. As the sun began to set, Tom wandered out to the jetty in front of our condo in Maui. With almost a month remaining on the island before departing for the Big Island, we leisurely enjoyed each day in Maui. For more details, please click here. It's truly gorgeous! What a wonderful confluence of events! 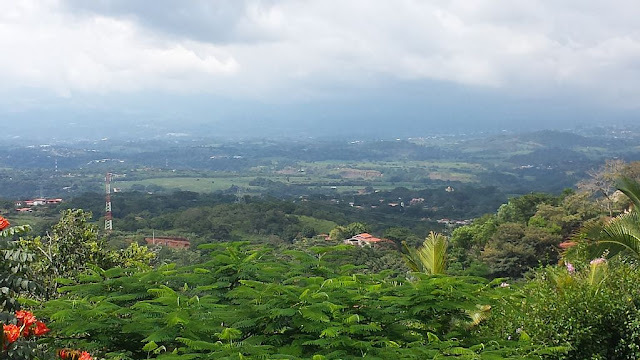 Costa Rica is so wonderful, and I know you will have a wonderful stay. Staci, we can't believe the good luck we have to have landed this lovely property. We're grateful to our friends for their generosity for making it work for us. Sounds as if you enjoyed Costa Rica. We're looking forward to doing the same. Thanks for commenting!